I find it quite humorous that for someone who cannot swim a stroke how much I love the nautical look. I think it's a combination of how clean, fresh, comfortable, yet somehow dressy nautical fashion is, and also how much it reminds me of the lazy days of summer, warm breezes, and water. Even though I'm afraid of deep water, I still love taking boat rides, laying in the sun on a beautiful beach, and watching ocean waves and wildlife. 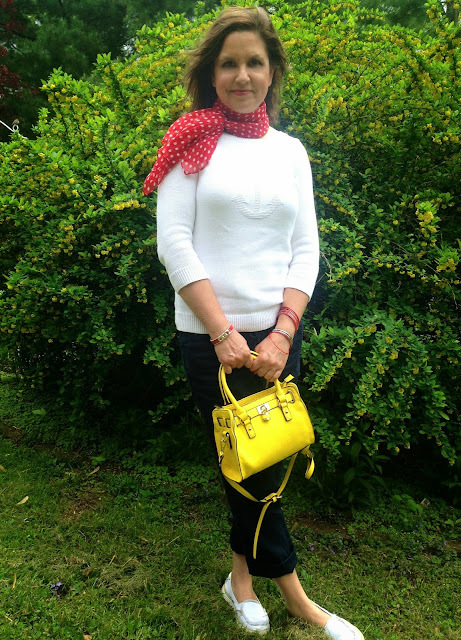 For today's look, I'm wearing a nautical sweater from Talbots (old), linen drawstring pants from J.C. Penney, a polka dotted red scarf (old, JCP), and white loafers (old, Dr. Scholls). 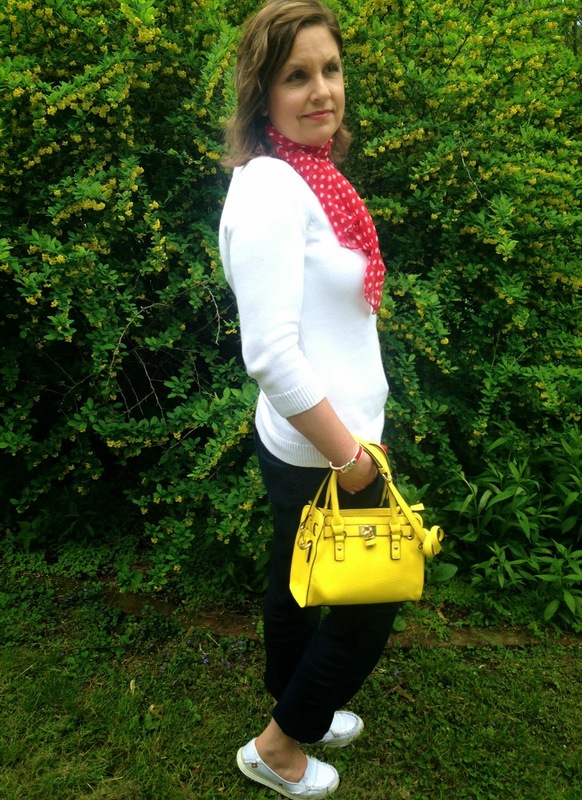 I wore all red jewelry (old, Old Navy) and carried my new yellow bag (Charming Charlies) to bring in a pop of color to an otherwise neutral outfit. My nautical sweater actually has an interesting story behind it. Two years ago we were vacationing in New Hampshire and one of the things we did was visit Mt. Washington Park and hike The Frankenstein Cliff Trail. Well on that hike, I wore a white sweater that ended up getting completely ruined due to the difficulty of that hike. (You can read my humorous account of that hike HERE). Since I was on vacation and I only had limited clothes with me, I needed a new white sweater to replace the one that got destroyed. The next day we visited the sweet, but affluent town of Hanover where I found a Talbots. Now, even though I like some of Talbots clothing line, they are usually a bit too pricey and 'old looking' for my taste. However, I did find this sweater on a clearance rack for about $20.00. I bought it on the spot for it was perfect for getting me through the rest of my vacation, and it was such a classic design I knew it would be a wardrobe staple forever (unless I wear it hiking on a treacherous mountain). :) I love it when clothing has special memories connected to it…don't you? It does make it hard to clear out your closet however! My scarf I bought last year and this was the first time I ever wore it. I absolutely love it, but it has always been hard for me to accessorize with it. If your wondering how I tied it, I simply wrapped it around my neck (like a choker), several times, then tied it in a knot and tucked the knot underneath. These linen pants from Stylus are so cool and comfortable I have been wearing them non-stop since I bought them. I'm sure they will be worn out by the end of the summer. I love the relaxed fit and drawstring waistband. They are perfect for lounging around the house in. Since I wasn't scheduled to sing this Sunday at church, I was able to wear something more casual. 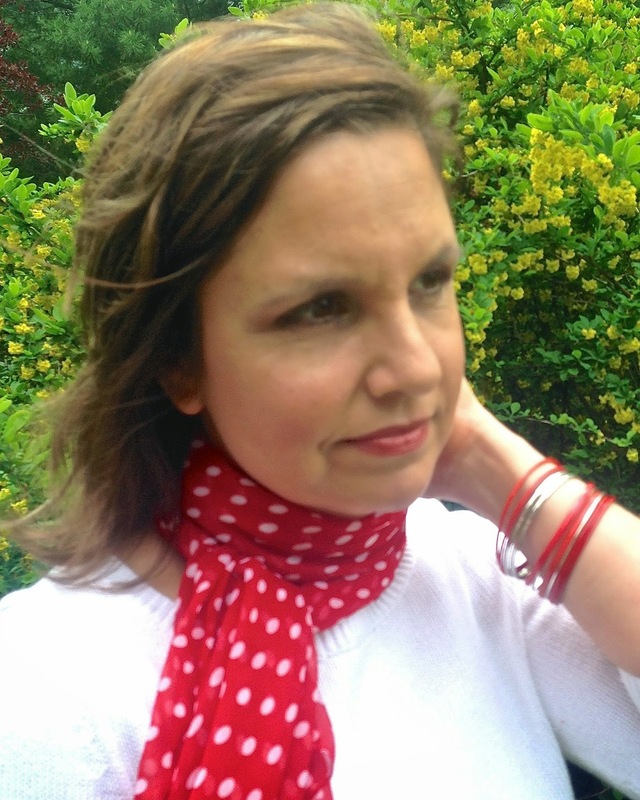 Even though the weather was in the upper seventies, the scarf and sweater kept me comfortably warm against the strong breezes of the ceiling fans…yet I looked summery! These are my go-too summer shoes! Because they are white, they go with just about anything, and I love the distressed look. 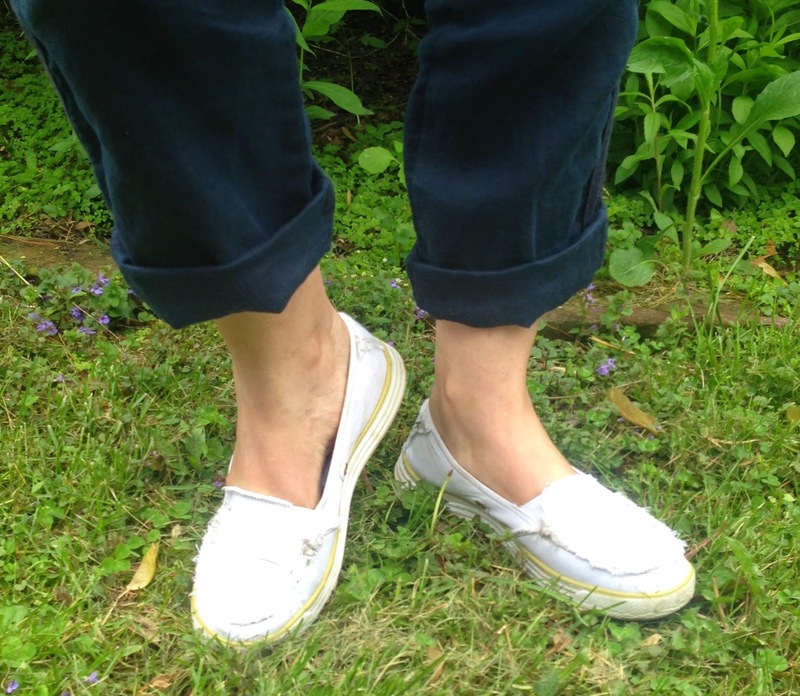 The fact that they are made by Dr. Scholls is even better…because they are so comfortable! This look is a great example of how you can look like spring or summer, and still be warm. It would be a great look on a cool spring day…or on an actual boat ride since the temperatures are so much cooler on the water. Linking Up With: Visible Monday, Style Swap Tuesdays, Bloggers who Inspire Me, Confident Twosday, Turning Heads Tuesday, All About You, I Feel Pretty, Trendy Wednesday, Tucker Up, Oh, Hey Girl, Jersey Girl/Texan Heart, Style Me Wednesday, Sydney Fashion Hunter, Throwback Thursday,and Look What I Got. That sweater needs to come home with me! What a cute addition to your wardrobe. Sorry for your hike incident and the ruined previous sweater, at least you lucked out on this one. 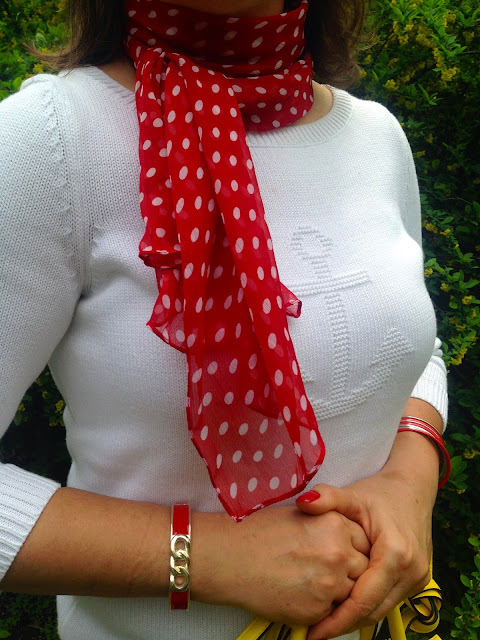 Love this crisp nautical look! Thanks for sharing with Visible Monday, xo. Love the outfit, Amy! I'm a nautical girl as well. Something about anchors and navy. Have a good week! Love this! You look so cute! I love how you tied that scarf. Love this nautical look head to toe. 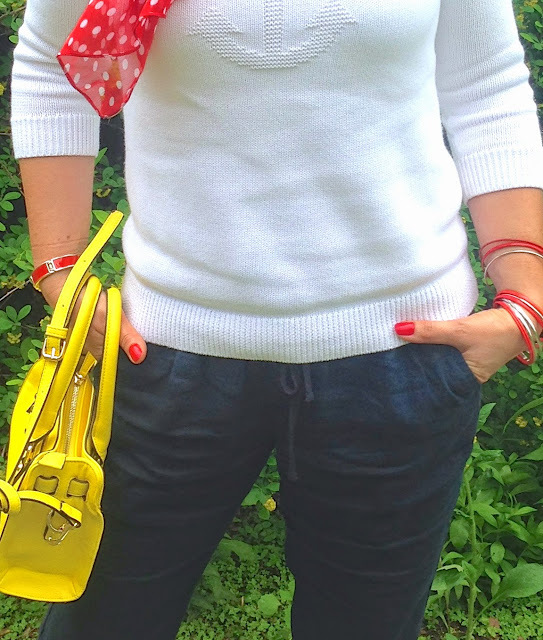 The tie-on scarf was a nifty add-on and that white sweater is gorgeous! Great outfit, it looks so comfy! Love the scarf! I love the bag! So cute. And the scarf is really cute too. Thanks for linking up to Look What I Got! Love this nautical look! 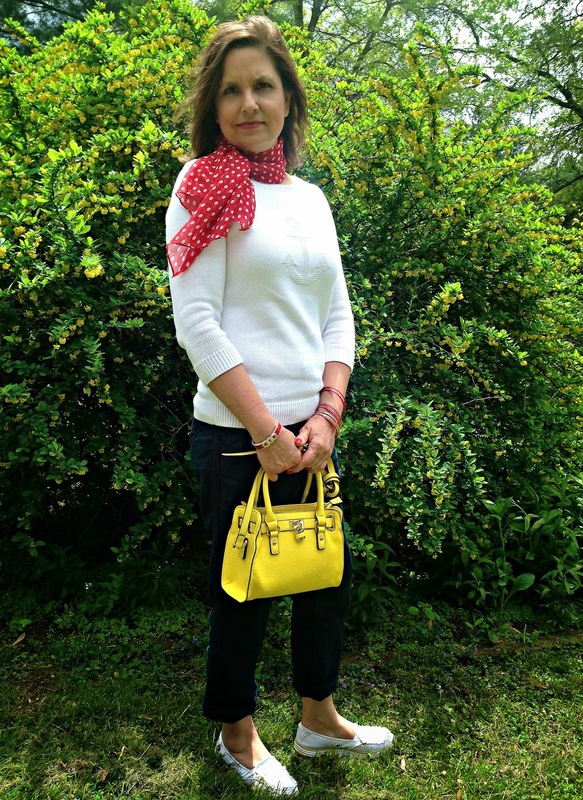 Your yellow bag is the perfect touch! That sweater is just GREAT! And, I love the red jewelry you added. I can't swim either :( Or at least, I haven't tried in water over my head. Yet, I love nautical pieces! I have my nautical shorts on today. 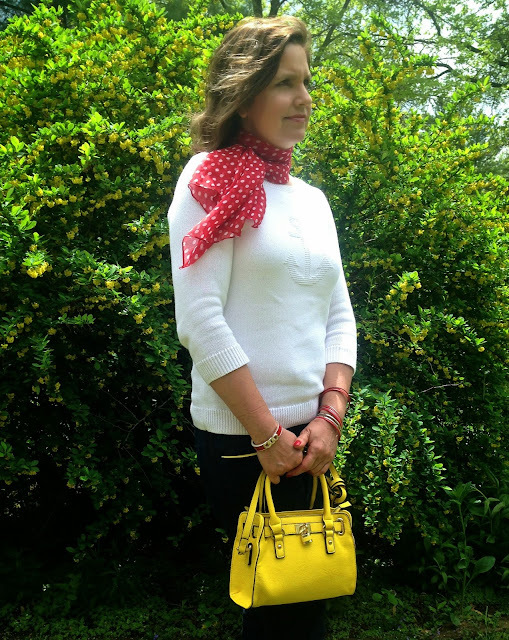 I love this nautical sweater paired with the polka dot scarf - perfect for memorial day weekend!